Discover the fascinating history of Western Poland and the little-known Russian exclave of Kaliningrad. See the spot where World War II began in Gdansk, the ruins of Hitler's bunker the Wolf's Lair and the secret military city of Baltiysk. Poland's capital is a wonderfully dynamic and modern city, but reminders of its turbulent history are easy to uncover. After World War ll around 85% of its buildings were left in ruins; however, the city has been impressively rebuilt and restored to its former glory with the Stare Miasto (the old town) as its centrepiece. Buskers, street artists and open air cafes give the area a unique energy and atmosphere, making a visit that little bit more special. In the city centre you will find numerous good Polish restaurants and the 'pierogi', Polish dumplings, are especially tasty. There are also many bars selling a range of local beers and of course a wide variety of vodkas. If you fancy something lighter then you could grab a 'zapiekanka', an open faced toasted baguette sandwich, which is a popular local fast food option. This morning we head out with our Explore Leader to discover the Old Town with its cobblestone streets, historic squares and gothic churches, it's easy to understand why it is at the top of every visitor's 'must see' list. We take in all the main sights including the 17th century rust red Royal Castle and the Warsaw Uprising Monument, a tribute to the Polish insurgents that attempted to end the city's Nazi occupation in 1944. After our tour and free time for lunch we leave the city and venture deep into the woods to the ruins of Hitler's secret bunker - the Wolf's Lair. Our guide will explain the history of the site where Hitler spent a lot of time towards the end of World War II before an attempt to assassinate him with a suitcase bomb was almost successful and compromised the strength of this concrete structure. We drive to our hotel in Gizycko, a town in the heart of the 'land of the Great Masurian Lakes'. The town is situated on a narrow strip of land between Lake Niegocin and Kisajno and is one of the most attractive locations in Poland due to the greenness of the countryside and the fact that it is surrounded by water. Today we drive across the border into Kaliningrad. Our drive takes us around three hours, but it can take an additional hour or two at the crossing point. Founded in 1255 by the Teutonic Knights, Kaliningrad (then Konigsberg) went through periods of Germanisation and colonisation until its almost total destruction by the British and Soviets in World War ll. Post war Konigsberg became part of the Soviet Union and was renamed Kaliningrad after Mikhail Kalinin, one of the original Bolsheviks. It was an area of great strategic importance during the Cold War, being the most western province of the USSR, and was closed to foreign visitors for several years. With the fall of the Soviet Union in 1991 the Kaliningrad Oblast became a Russian exclave - still a part of Russia but separated geographically from the rest of the country. Sights including the cathedral, symbol of Kaliningrad, Soviet House and the Immanuel Kant Museum - one of the city's most famous former residents. There's an interesting mix of historical and modern architecture with the pre-war Konigsberg Cathedral having been restored, through to the much more recent Cathedral of Christ the Saviour situated in Victory Square. This evening is free for you to sample the local cuisine, which tends to be a blend of Russian and German delicacies along with fresh seafood. Today we will discover more of Kaliningrad, outside of the main city, by visiting the coast. Our first stop is in the city of Baltiysk, which is home to a Russian Naval base. During Soviet times access to the city was forbidden and even now it's strictly controlled and foreign visitors need pre-authorised permission to visit, which we will have. During World War II is became a German U-Boat training facility before being captured once again by Russia's Red Army in 1945 and its name was changed to Baltiysk in 1946 as part of their Russification campaign. A few years later it became a key naval base and a closed city for the Soviet Navy's Baltic Fleet, as it is only one of two ice free ports on the Baltic Sea that are available to Russia to use. Following our tour of historic Baltiysk we head to Yantarny to learn more about the history of this amber mining region. Amber was first collected commercially here by the Teutonic Knights who set up a monopoly in the trade. The tradition of amber mining continued and, at its peak, was producing over 650 tons of amber a year. You'll have the chance to find your own piece to take home as a souvenir and we'll stop at an amber mine canteen where you'll have the opportunity to taste an authentic Russian lunch. Next we drive to the coastal resort of Svetlogorsk on the Zamland Peninsula. This area was very popular with German vacationers in the 19th century who would come to this spa town to take in the sea air and therapeutic waters. During our visit we can see the Art Nouveau bath house, 19th century water tower or just stroll along the beautiful tree lined avenues and the promenade. This evening you can either return to Kaliningrad on our bus or you may choose to hop on a train back to the city. At Kaliningrad train station there's a fascinating locomotive section and a statue of Lenin worth seeing. Today is free in Kaliningrad city for you to explore more at your own pace. Perhaps you might like to visit the Museum of the Oceans where you can see the only pre-atomic era submarine left in Russia. Alternatively you could go to the Bunker Museum, which is housed in the World War II bunker where General Otto Lasch organised his defence of Konigsberg and ultimately signed the surrender of the city over to the Russians on the 9 April 1945. If you fancy something a bit lighter then perhaps you'll choose to attend an organ concert at the cathedral. This morning we visit a market where you can mingle with the locals and we have the chance to purchase a picnic lunch of native specialities. We then drive to Fort 5 on the outskirt of the city and have time to go into the fascinating tunnels here before continuing to a World War I Cemetery with its impressive monuments and the Hill of Glory. We spend the rest of the day walking in the UNESCO World Heritage Site of the Curonian Spit National Park. This 98 kilometre long, curved spit separates the Curonian Lagoon and the Baltic Sea and is half Russian, whilst the northern half is Lithuanian. During our visit we will only spend time on the Russian side, exploring trails and footpaths in this beautiful landscape and learning more about the area at the local museum. Curonian Spit National Park is home to the mysterious 'Dancing Forest', also known as the drunken forest. The park is however best known for its large and beautiful sand dunes, likened by some to Namibia's skeleton coast! After exploring we drive onto Zelenogradsk where we stay this evening. This town was previously the royal bathing resort for the Kingdom of Prussia due to its sweepingly long sandy beach. Nowadays you can enjoy the seafront and see an interesting blend of old German architecture, modern villas and crumbling Soviet tower blocks. This morning we return to Gdansk, Poland. Our journey will take approximately three hours and crossing the border can sometimes take a bit of additional time. 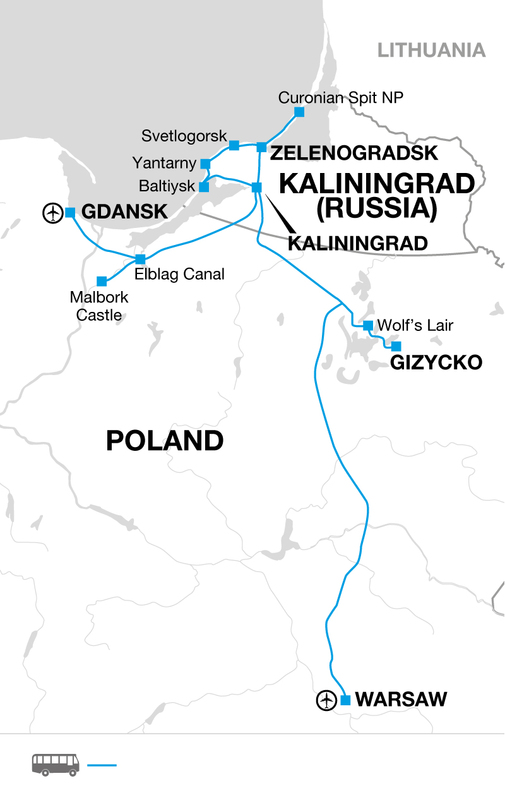 En route we will visit the fascinating Elblag Canal where boats travel in part on the water and then also along rails. Due to steep variations in height the designers felt that it would be too tricky to put in a system of traditional locks, so instead a local engineer had the idea of picking the boats out of the water on giant cradles and onto railroad cars to pull them up the steepest sections on rails. It was hailed as one of Europe's most impressive engineering wonders and although today it's not frequently used by the shipping industry it is a popular route for recreational boats and you'll have the opportunity to board a ferry to experience a section of it for yourself or to take a walk along the canal to photograph the ferry passing along it. Our next stop is the impressive Malbork Castle. Built by the Teutonic Knights it's an outstanding example of the castles that were created all over medieval Europe to help protect the frontiers. It is the largest castle in the world by surface area, the largest brick building in Europe and a UNESCO World Heritage Site. This evening we arrive in Gdansk and check-in to our hotel. The city is located on the Baltic coast and is Poland's largest sea port as well as one of its oldest cities. This morning we enjoy a guided walking tour of the distinctive maritime city Gdansk, which doesn't feel like the rest of Poland. Its architecture has been influenced by the wealthy merchants that have passed through the city's port, as well as the Prussian Teutonic Knights, Slavic Poland and of course the devastation that rocked the city during World War II. We wander through the maze of narrow cobbled streets past red bricked churches, amber shops, grand old buildings and pretty waterfront bars and restaurants. Our tour will focus on the Solidarity Movement which took place here in the 1980's, where the anti-communist Polish trade union rose up against the government. The conflict and resolution that began here is said to have played a crucial role in the downfall of communism and the Soviet Union. We'll see the ruins of the Westerplatte and the Free City of Danzig, which was its own state from 1920-1939. After World War I the control of Gdansk became a major sticking point at the Treaty of Versailles negotiations, as both Poland and Germany wanted to keep the city and its valuable port location. Germany were in no position to rebuild the economy or infrastructure, but there was a large German speaking population, so to quell fears of an uprising, a deal was struck to create the Free City State area of Danzig. It issued its own passports and had its own parliament, currency and stamps, and the economy grow well, up until the beginning of World War II when the peace it had known was shattered. When Hitler was elected in neighbouring Germany, anti-Polish sentiment spread quickly in Danzig and with most of the police force being German they started keeping close tabs on any Polish residents that they saw as a threat to their ideology. Tensions hit fever pitch when Nazi's dressed in Polish army uniforms staged a fake attack in nearby Gliwice, supposedly against Germany, and this then gave Hitler justification in the eyes of the German people to retaliate. The following day German attacked Poland on the Westerplatte and this was the trigger that starter World War II. This afternoon is free for you to relax and discover more at your own pace. Perhaps you'd like to see the city from a different angle by joining a canal tour. Alternatively you could visit the Museum of the Second World War with its huge range of exhibits. Our trip ends at our hotel in Gdansk after breakfast. Kaliningrad: Train back from Svetlogorsk to Kaliningrad approximately 70 RUB; Museum of the Oceans entrance 400 RUB; Bunker Museum entrance 150 RUB; organ concert in the cathedral approximately between 140-1375 RUB. Elblag Canal: Ferry ride approximately between 50-70 PLN. Gdansk: Canal tour in four-person boats 80 PLN for 30 minutes or 100 PLN per hour; Museum of the Second World War entrance 25 PLN. July and August are the warmest months and lightweight cotton clothing is best. During spring and autumn temperatures can be lower or drop during the evenings and there is also a stronger possibility of rain, so pack layers. You'll need your swimming costume and a towel. Light rainwear may be needed at any time of year. A warm fleece/jacket is recommended for cooler evenings. Ladies should take a headscarf to cover their head when entering religious sites. We recommend taking a water bottle for our included walks, sun glasses, sunscreen and a sun hat. Also a torch may be useful in case of emergency and for when visiting Fort 5, as it can be dark inside. You might find walking poles helpful and insect repellent for walking in the Curonian Spit National Park. Although entirely voluntary, tipping is a recognised part of life in this region of the world. Some local staff will look to members of the group for personal recognition of particular services provided. Accordingly please allow £20.00 for tipping. Please note that the majority of hotels used on this trip don't have air-conditioning and that it can be hot in summer. All nationalities require a single entry Russian visa in order to enter Kaliningrad. As part of the visa requirements you will need to obtain a Russian Travel Voucher and Authorisation from the local Russian authorities. Explore will request this on your behalf approximately eight weeks prior to departure. Please allow a minimum of five working days for the travel voucher and authorisation to be processed. Due to the visa processing times, Explore are unable to accept bookings within one month of travel. It is essential that you provide Explore with the correct passport information at the time of booking, as this will be required in order to request the travel voucher and authorisation, as well as gaining permission to visit Baltiysk. Corrections and amendments will incur additional charges, so please double check that the information we have for you is up to date and correct, this includes your passport number, full name as per passport (including middle names), date of birth and place of birth. If you intend to renew your passport please let Explore know at the point of booking and please ensure that you have the new passport no later than eight weeks prior to travel. In order for Explore to provide the necessary documentation to support your visa application (i.e. your visa authorisation), all pre or post tour accommodation in Russia must be booked through Explore and not booked independently. Please ensure that your passport has a minimum of six months validity from the date of return to your home country and your passport is signed in the appropriate section. Poland: Visas are not required by UK, US, Canadian, Australia or New Zealand citizens. Other nationalities should consult the relevant consulate. All visa information is subject to change, so please check with your local consulate for the most up to date advice for the countries you are visiting. All other nationalities should check with the embassy. In order for us to obtain permission to visit the closed city of Baltiysk we need to have received your passport details a minimum of 40 days before your trip departs. There are few places in Europe that are truly off the beaten track, but this is the case on this trip. Kaliningrad is a Russian exclave that many people would struggle to find on a map, and within this region is the secret naval city of Baltiysk where special permission is needed to visit. This holiday is perfect for experiencing undiscovered destinations and to be immersed in the fascinating history of Eastern Europe.